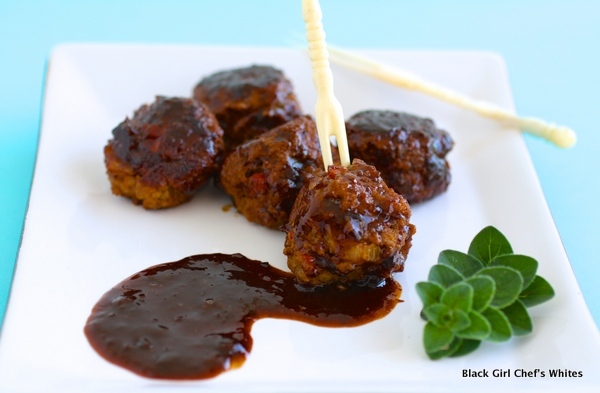 Cherry Chipotle Glazed Turkey Meatballs is a rather fancy name for these easy to put together appetizers. What makes them so easy is Cherry Chipotle Not Ketchup, a delicious new dipping sauce from my friend Erika Kerekes of In Erika’s Kitchen. Not Ketchup sauces are made with ripe fruit instead of high fructose corn syrup for sweetness, and savory vinegar and spices to balance the flavors. It is a delicious addition to the dipping sauce aisle, but it is much more than that. When this sauce is mixed with boring and bland lean ground turkey, a transformation takes place. The turkey soaks up the sweet, tangy heat of the sauce, making a juicy and flavorful bite size treat. 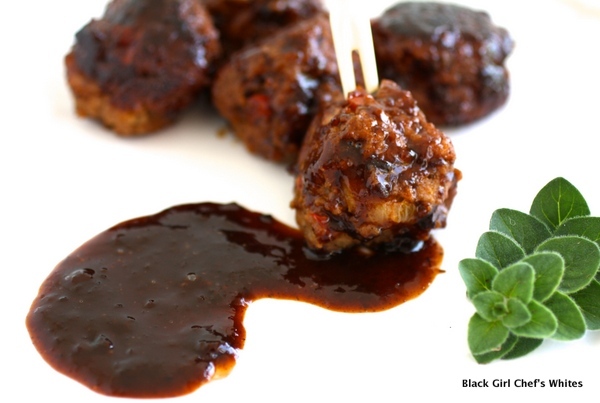 These meatballs make wonderful appetizers or as a dinner entree. I think the next time I make them I will toss them with some pasta and vegetables. While the sauces are not available in stores nationwide yet, you can order them directly from the Not Ketchup Shop. Head on over there and help a female owned business grow! Heat 1 tablespoon olive oil in a small saute pan over medium high flame. Add the onion, red pepper, cumin, salt, pepper and oregano to the pan, stirring to mix. Cook the vegetables and spices, stirring occasionally, until softened, about 5 minutes. Remove the vegetables from the heat and let cool. Place the turkey, panko bread crumbs, cooled vegetables and 1/3 cup Not Ketchup into a large bowl. Mix the ingredients together well, then form golf ball sized meatballs. Heat about 2 tablespoons of olive oil in a deep skillet. Brown the meatballs in batches. Place them onto a large baking sheet. Baste the meatballs with more Not Ketchup to form a glaze. Bake until cooked through, about 8-10 minutes. 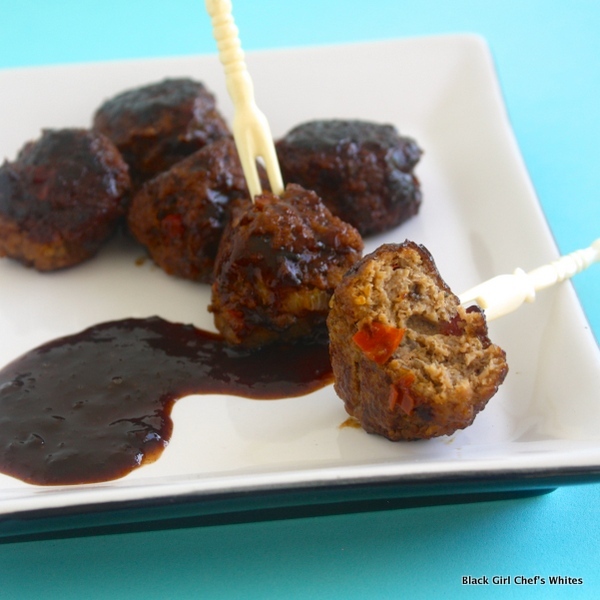 If desired, serve the meatballs with more Cherry Chipotle Not Ketchup for dipping. These meatballs look amazing. Good on you for supporting Erika’s business! Cheryl, these look so yummy. Great idea for Super Bowl Sunday. Oh my, my, those look so good! Cheryl, these look fantastic! So glad you found a good use for the Cherry Chipotle Not Ketchup…I think I’ll be putting these lovely meatballs on my Game Day menu!